The City of Chicago is considered one of the best cities for biking – at least when the seasons cooperate – thanks to more than 200 miles of bike trails including an almost 19-mile stretch along Lake Michigan. In fact, in 2016 Chicago toppled New York City as the top bicycling city in the country, according to Bicycling magazine. According to the magazine’s editor-in-chief Bill Strickland, the city, which has been steadily climbing spots since 2012, took the top slot due to infrastructure that’s in place throughout much of the city that separates bike lanes from vehicular traffic. “Awareness of infrastructure, through separated bike lanes, is the next thing that needs to happen to really change cycling and what it means to live in an urban area,” Strickland said in an interview with the Chicago Tribune. In a move that’s likely to help Chicago retain that top spot, the 2020 Chicago Streets for Cycling Plan calls for more than 400 miles of new paths, both in heavily populated areas and where there are fewer riders on the roadways. Chicago also has more than 13,000 bike racks as well as sheltered bike parking at several Chicago Transit Authority rail stations for those who include their bike as part of their commune. Still, bicycling can be treacherous in the Windy City. In 2016, a 20-year-old woman riding in a bike lane was killed when a semi moved into the right lane, hitting her and pulling her and her bike beneath the tractor-trailer’s wheels. The accident happened on Milwaukee Avenue, the busiest area for cyclists in the city, and occurred on a side of the street with no buffer in place to separate cyclists and motorists. “It almost seems inevitable. Just the volume of bikes and you see how the lanes get squeezed in there. You’re surprised you don’t hear about it more often,” business owner Bill Zigmond told the city’s Fox affiliate station. Still, that’s no reason to give up cycling in the city. It’s just important to take steps to stay safe while riding. Should I Wear a Helmet? Am I Required to Wear a Helmet in Chicago? While Illinois has numerous laws on the books related to bike safety, wearing a helmet is not a legal requirement. That said, there are rules governing cyclists as well as drivers as they relate to cyclists in the state. Working lights and other equipment designed for visibility must be installed. Headlights should be visible from a distance of at least 500 feet, and rear reflectors are also a requirement. For safety purposes, flashing taillights – or helmets with flashing lights – boost visibility significantly. Cyclists must ride on the road or in approved bike lanes, not on sidewalks. Cyclists are required to ride as close as possible to the right-hand curb or the edge of the street, without putting themselves at risk due to debris or other roadside hazards. Drivers must be aware of cyclists, and cannot legally open a car door into a bike lane if a cyclist is approaching. Drivers are legally required to leave enough room for cyclists when approaching to allow cyclists to stay out of harm’s way. Wear a helmet. Helmets have been shown to reduce the risk of brain injury by up to 88 percent, according to some studies. Travel like a car. Follow the same rules of the road that you would when driving and bike in the same direction as traffic. Be seen. The more visible you are – bright biking attire, lights and reflective strips are helpful – the less likely vehicles will hit you. Stay attentive. That means keep distractions to a minimum. Don’t listen to music or talk on the phone while riding, and pay attention to your surroundings. Use turn signals. Make sure that other vehicles on the road know where you are going if you plan to turn by using signals. When crossing a road, make eye contact with other drivers to ensure that they know where you are and wait for drivers to come to a stop before turning in front of them. Assess your comfort levels. Make sure that your bike seat is adjusted properly so you can better control your bike. Do a safety check of your bike. Check tires for proper inflation and make sure your brakes are working before heading out to make sure that your bike is ready for riding. Still, no matter how much attention you pay to safety issues, accidents can still happen. Dooring accidents. Dooring accidents are those that happen when a bicyclist hits a car door or swerves to avoid a car door that has been opened into his or her path. Dooring accidents are particularly common in busy areas with heavy traffic, which includes most of Chicago’s neighborhoods. Sideswipes. Sideswipes occur when drivers don’t follow the law and fail to leave cyclists enough room when passing. Cyclists run the risk of a dooring incident in heavy traffic or can potentially be injured by the mirrors of a passing car. Rear-ending accidents. Drivers that follow too close at a stop sign or fail to allow cyclists enough room when they are moving to the left to avoid parked cars run the risk of rear-ending the cyclist. Accidents caused when vehicles cross into a cyclist’s path. Visibility is often a factor when drivers cross into a bike’s path at an intersection, driveway or alley, hitting the cyclist who is already in the intersection when the collision occurs. Right-side collisions. When drivers fail to check their blind spot at intersections when making a right turn, they run the risk of turning into a cyclist who is also at the intersection. Right-side collisions can occur at a stop light or when bikes and cars are both in motion, but each can be potentially life-threatening. Distracted drivers. Cell phones, breakfast coffee spills, and other distractions can be deadly for cyclists if they happen to a driver behind the wheel when a bicycle is sharing the road. Weather. While snow and sleet generally keep cyclists off the road for a good portion of the year, with summer weather riding increases significantly. That means cyclists may be making their commute home from work in the midst of rush hour, which often coincides with the rising or setting of the sun, which can cause a dangerous glare that can erase visibility. Rain can also start suddenly, impairing visibility for both cyclists and motorists. Drivers operating a vehicle while under the influence. Drivers who have been drinking or using illegal drugs generally have a slower reaction time, making them less able to avoid a collision with a cyclist. While many accidents are caused by drivers, cyclists can also create a risky environment by failing to follow safety guidelines or by riding recklessly. Weaving in and out of traffic, making sudden movements into the path or oncoming vehicles, riding through stop signs or other unsafe riding practices can easily trigger an accident. Help, I got in a Bike Accident and Don’t Know What to Do! If you do get into an accident, you may be wondering what steps to take to get yourself back on the road. Experts recommend taking certain steps, even if you think the accident was minor and you don’t initially think you were injured. First, call the police. A police report will be important evidence in the event of injuries and will offer a clearer picture of what happened. That’s vital if you need to submit a claim to an insurance company. Take down the driver’s information including insurance information, contact information, and a license plate number. Also, gather information from any witnesses who were at the scene. Don’t minimize any injuries, either to you or your bike. Make sure you seek medical attention, even if don’t immediately realize that you’ve been injured. Adrenaline can hide serious injuries. The same holds true for your bike. You may not initially see any damage, but that doesn’t mean your bike is safe to ride. An experienced bike repair person can give your bike a thorough inspection to make sure that there isn’t any hidden damage that can cause an accident later on. What Can a Bike Accident Attorney do for Me? 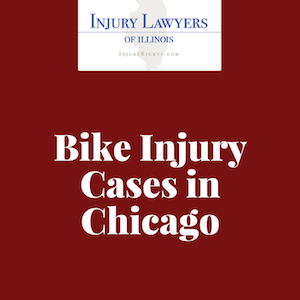 If you’ve been injured in a bike accident in Chicago that was no fault of your own, a good attorney can be your best asset. An experienced lawyer will have a clear understanding of the laws protecting cyclists and will do his or her best to ensure that you receive compensation to cover the costs of your injuries, which can often be extensive given the weight of a vehicle compared to a bicycle. If you or a loved one has been injured in a bike accident, call our offices today. We don’t charge any fees for personal injury cases unless we win your case, and your initial consultation is free.